Power up 4 devices and share only the power that is needed between them! The new Coolgear multi port splitter supports 4 USB Type-C or USB Type-A devices to be powered up or charged. With a uniquely designed circuit structure, the multi port 60W PoE splitter is a great solution for device multi tasking power. The Coolgear Commercial / Industrial Use Power Over Ethernet delivery device provides Dual Output Ports for Legacy Apple/Samsung/QC3.0/ Etc. Charging profiles USB Type-A and New USB type C PD Provides Supporting 5V/7V/9V/12V/15V/20V and PPS 3V-20V at up to 3A so you can Power up to 4 Devices Simultaneously. The CGL-POE60W4P multi port splitter will work with any power sourcing equipment that also supports 802.3at/af standards. The CGL-POE60W4P impressive electrical design is a 4 port splitter that can share power between ports. How does it share power? You will only use USB-C or USB-A ports for devices (4 USB-C or 4 USB-A). Each port essentially reads the voltage requirement of the devices connected to it. When a device or some devices have used the power they need, the remaining power ports will receive more power to fulfill the other device requirements. 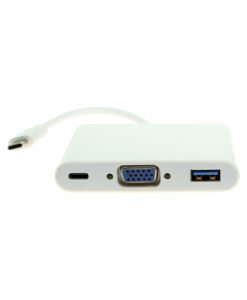 Can share power between ports as devices no longer need power. Can use 4 USB Type-C Ports or 4 USB Type-A Ports.